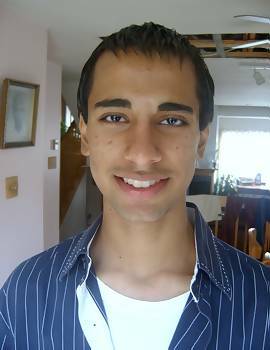 On March 10, 2003 Kash's 13-year-old brother Arwinder was teased by his father. The reason was both brothers had shaved their heads bald the previous Sunday. The father jokingly asked Arwinder," How's the Buddha?”He replied with a laugh that He is alright. Sensing that he was serious his father continued since Kash always maintained that a few Divine Beings, including Shri Buddha, were invisible. Arwinder was indicating that he had seen the Buddha, that is the Enlightened One had a spirit body. beyond any doubt or dispute. Yesterday, February 15, 2007 at around 7.00 p.m. i decided to ask some questions regarding Shri Buddha. i had just updated some information on the webpage and decided to ask about Shri Buddha, a chance that i forgo in 2003 due to the overwhelming, irrefutable evidence given by Kash, Arwinder and Lalita since 1993. After more than a decade there was just no desire to ask further information. However, since last year Arwinder and Lalita have been unable to enter their Sahasraras any more. So i just wanted to know if Arwinder could recall from his experiences, which both Kash and Lalita find very difficult now. i asked him what Shri Buddha's physical features were like. Note: Arwinder will be turning 17 next week and is an excellent student. Yet WCASY (World Council for the Advancement of Sahaja Yoga) want all SYs to shun him (and his family) since they think he and his brother Kash and sister Lalita are all possessed and demonic. As far as WCASY is concerned such mystical feats are impossible, and thus can only be the work of evil. When told what other SYs think of him Arwinder, absolutely assured by years of daily encounters with Shri Prajnaparamita since turning five, just smiled. i think those who judge him so harshly are possessed ..... by ignorance, at least. Note: i have taken two photos of Arwinder holding both sides of the envelope on which the notes of his answering my questions regarding Shri Buddha were scribbled on February 15, 2007. The envelope will be kept as evidence too. i just want to add this again. Like the rest of his siblings, Arwinder has never discussed with anyone outside the family his meeting the eternal, ever-youthful and extremely beautiful Devi in his Sahasrara. He has no desire to do so. i did tell him last October to write down as much as possible of his discussions with the Divine Mother. Till today he has not started as it is no big deal for him to have met the Devi daily for years. None of us are interested in any recognition or praise. We just want to complete our duty of bearing witness and presenting evidence of the Devi for all Her devotees. Other than that we just want to remain a normal family that highly values privacy and a low-profile. Prajnaparamita, the goddess depicted in the center of this ca. 17th century folk tradition thangka, is the paradigmatic goddess from whom virtually all other Buddhist goddesses arise. She is the ultimate Buddha Matri, or"Mother of Buddhas," making her an enlightened being as well, and thus, a female Buddha. Prajnaparamita is identified in this painting by the small delicate linear gold painted rendering of a book resting on the lotus in her left hand. This book is the goddess namesake text, the Prajnaparamita Sutra, or the"perfection of wisdom. She, and the text, encompass and represent the wisdom that all enlightened beings must attain, and subsequently both are seen as the progenitors of Buddhas. 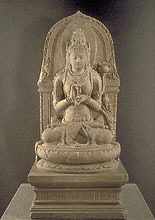 The central goddess is depicted with four arms and is seated in lotus position on a lion throne. In her left hand she holds a lotus, on which rests the book described above. Her right hand also holds a lotus that supports a vertically balanced vajra. Her primary hands are held in front of her torso and make the gesture of teaching, dharmachakra mudra. This combination of iconography is known in other painted examples and its combined meaning is clear. The vajra symbolizes adamantine compassion and the realization of bliss which, when combined with the book, representing the perfection of wisdom, creates full enlightenment. The goddess' primary hands held in dharmachakra mudra refer to the teaching capacity of the goddess, and subsequently, the purpose of the specific teaching which she personifies. The Goddess of Transcendental Wisdom is seated in lotus position on a round lotus cushion that has been placed upon a rectangular base. She raises her hands in front of her chest in the gesture symbolizing the Turning of the Wheel of the Law associated with the highest figures of the Buddhist pantheon. From the lotus cushion rises a stalk that winds itself around the left arm of the goddess and ends in a lotus flower. On top of this lotus flower rests a palm-leaf manuscript of the Sutra of Transcendental Wisdom, or Prajnaparamita-sutra, the traditional attribute of the goddess and the repository of the wisdom, which she personifies.